The New York Times has said that its local printer in Thailand has refused to print its Asia edition because it featured an article on the ailing king. The paper said the printer found the front-page article "too sensitive". Tuesday's entire newspaper, however, can still be viewed online in Thailand. King Bhumibol Adulyadej, 87, is currently in a Bangkok hospital. Thailand has strict lese majeste laws that can result in jail terms for anyone who insults the monarchy. Critics say the laws are used liberally by the military government to silence discussion about the royal family and the succession to the throne. The Thai authorities have blocked a number of other news websites, notably the UK-based Daily Mail, after one article last year which included salacious details of Crown Prince Vajiralongkorn's private life. That censorship precedes last year's military coup, although it has increased since the military takeover. The military has shown itself to be extremely sensitive to any reporting on the royal family, with both the number and harshness of convictions for lese majeste rising sharply after the coup. As the New York Times details in its article, Thais have been jailed for an overheard conversation in a taxi, a hand gesture, a university play, bathroom graffiti and most recently, two sentences of 28 and 30 years for Facebook posts. Military ruler Prayuth Chan-ocha has also become visibly more irritated by media criticism of his performance, threatening to tape journalists' mouths shut, and to find other ways of punishing them. Last weekend prominent journalist Pravit Rojanaphruk was detained, driven blindfolded to a secret military base outside Bangkok, and held for two days in a windowless room while being interrogated over his alleged links to anti-military conspiracies. He says it was made clear to him this was punishment for speaking out. 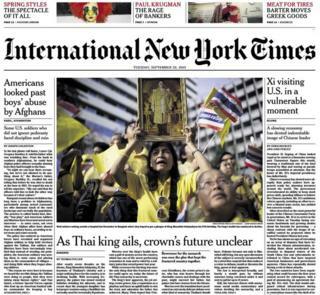 The International New York Times (INYT) emailed subscribers in Thailand saying that Tuesday's edition was not printed as "it includes an article that our locally contracted printer deemed too sensitive to print". "This decision was made solely by the printer and is not endorsed by the International New York Times," it said. The article notes that the king has been in and out of the hospital in recent months and discusses his successors, particularly Crown Prince Vajiralongkorn. Written by the paper's South East Asia correspondent Thomas Fuller, who is based in Bangkok, it also comments that lese majeste laws have stifled discussion on the issue in Thailand. The last update on King Bhumibol released by palace authorities was in August when they said he was recovering from hydrocephalus, or excessive build-up of fluid on the brain. The monarch has had frequent bouts of ill health in recent years. His health is closely watched in Thailand as he is seen as a unifying symbol and pillar of stability in a society that has seen increased political divisions and violence.